Launch the Key Manager program: click the shortcut located in the Board 7 programs group of your Windows Start menu. Alternately, double click the program file KeyManager.exe. located in your Board installation directory. Company Name : type your company’s name. Contract Code : insert your company’s contract code (this field is not case sensitive). Email : type the authorized e-mail address that you want the certified Key file to be returned to. Note: if you type a non authorized address it will be ignored and the certified Key file will be returned to your company’s authorized e-mail. User ID : type the name of the KEY file. Since the KEY file is linked to the computer (it will only enable the computer where it is created), it is recommended you use a name that identifies the computer. 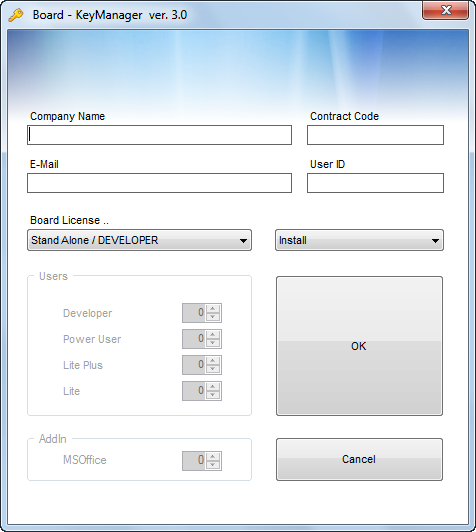 BOARD License : select the BOARD license type from the pull down menu. In case you select a Master license, type the number of users for each user license: Developer, Power User, Lite+, Lite and the number of MS-Office Add-in users. After clicking OK, a file named [User ID].key (where [User ID] is the name typed in the User ID field) is created in the same directory where KeyManager.exe is located. This is the half-KEY which needs to be certified.